'Domaine' (Keith Keppel, R. 2002). Seedling #98-70D. IB, height 26" (66 cm), Early midseason bloom. Standards blended greyed rose amethyst (M&P 45-H-7) paling to rosy ecru (13-A-6) edge; style arms blended samovar (12-K-7) to cinnamon (12-E-7), edged cornsilk (10-G-3), midrib flushed lavender; falls darker red raspberry to light burgundy (55/56-C-11), speckled hafts with pale apricot (9-F-6) ground; beards orange red (2-D-12), tile red (3-D-12) at end. 'Fancy Woman' X 'Brash'. 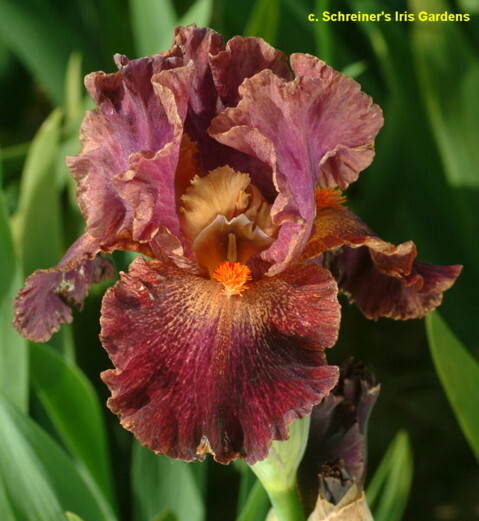 From AIS Bulletin #328 January 2003 Introducing DOMAINE EM 26" (Fancy Woman X Brash) Greyed raspberry lumi-plic, falls shaded burgundy, light apricot ground, tile red beards. #98-70D. $20.00. Keith Keppel. jpeg domaine8.jpeg manage 77 K 18 Sep 2018 - 02:51 Main.TLaurin Photo by Svetlana Yakovchuk-Ukraine. jpeg domaine9.jpeg manage 256 K 18 Sep 2018 - 02:52 Main.TLaurin Photo by Svetlana Yakovchuk-Ukraine.